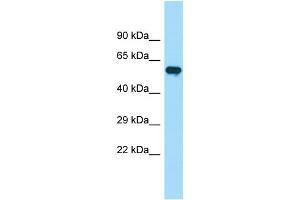 Characteristics This is a rabbit polyclonal antibody against PIP5K1B. It was validated on Western Blot. Background PIP5K1B participates in the biosynthesis of phosphatidylinositol 4,5-bisphosphate. It mediates RAC1-dependent reorganization of actin filaments and contributes to the activation of PLD2. Together with PIP5K1A is required after stimulation of G-protein coupled receptors for stable platelet adhesion.